Put your knowledge and passion into action to make change. Check out the Together We Will RVA "Citizen Lobbying 101" and "Activism 101" guides as a start to build your local coalition. Local decisions are swayed by input. Contacting your elected representatives early and often is crucial to this process. Click on the images below to send an email, sign up for their email newsletters, attend your district meetings, or call them (School Board, City Council, or Mayor). Click on the images below to learn about ongoing efforts to move Richmond forward. The idea and framework emerged from two years (2014-2015) of researching and writing about Richmond. The intentions behind this blog were to serve the personal sanity of the author, and to make his mom proud that his words were on the internet. What ended up happening is that research on topics like education-led economic development or the Academic Improvement Plan, started to gain attention of elected officials and the community. Also, during 2015 the RPS Facilities Task Force was formed and comprised a range of community stakeholders. Many of those who would become the driving force behind Richmond Forward met here. When the 300-page school facilities plan was completed by the Facilities Task Force and community meetings were being held, there was no online resource with publicly accessible background documents. In effort to provide transparency and translation, the website was formed to post all materials and graphic designer Gabriel Vernon developed this One-Pager. Elkhardt Middle School was closed in February 2015 due to dangerously high-levels of mold, and a small group from the facilities task force reached out to Area 10 Faith Community who helped provide communications and food to help Elkhardt staff move. Over 40 volunteers responded and CBS6 news provided coverage to raise awareness. The overwhelmingly positive response solidified in our minds that organizing to improve education and neighborhoods was a major need in Richmond. In 2016, we experimented from our base as a transparency tool to policy analysis, student expression projects, and advocate training. Please read our exciting 2016 Year 1 recap for more background. In 2017, we’re focusing our approach to act as a value-added resource of policy analysis and education. We still believe in raising the level of engagement within the community, but will rely on strategic partnerships within communities to “bring more people to the table.” We’re going to focus on what they are eating at the table. If your heart is invested in the children of Richmond, you know that our education system can, should, and needs to do better. 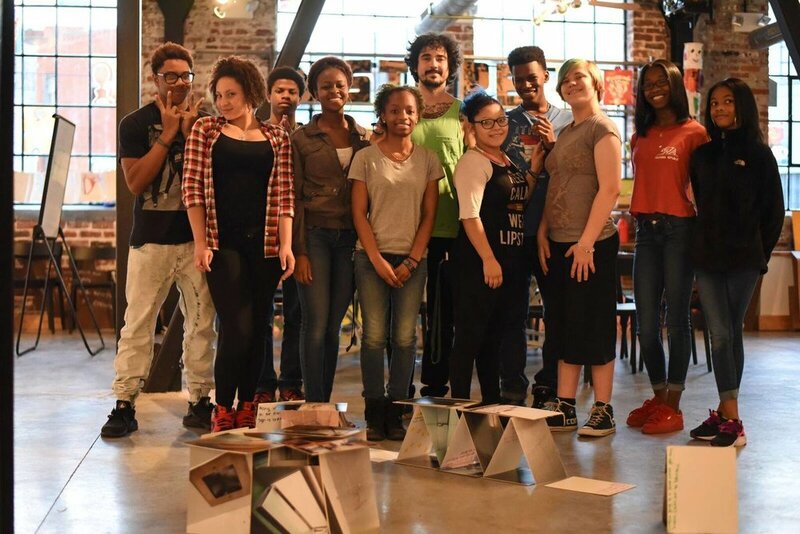 We know that schools alone cannot achieve the future of a world-class education system in Richmond, as challenges in transportation, housing, the economy, poverty, racism, immigration policy, criminal justice, the environment, physical and mental health, all directly impact the classroom. 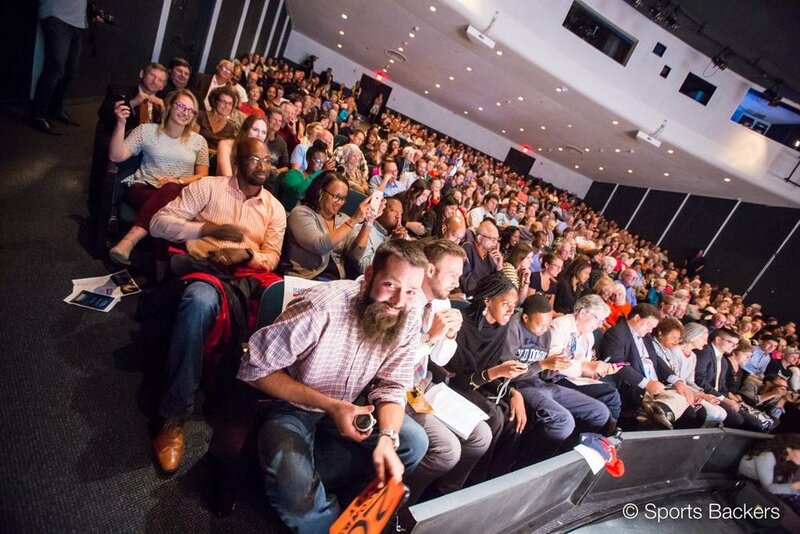 It’s time we gathered to deconstruct the professional and class divides within or community. The divide of RVA and Richmond. 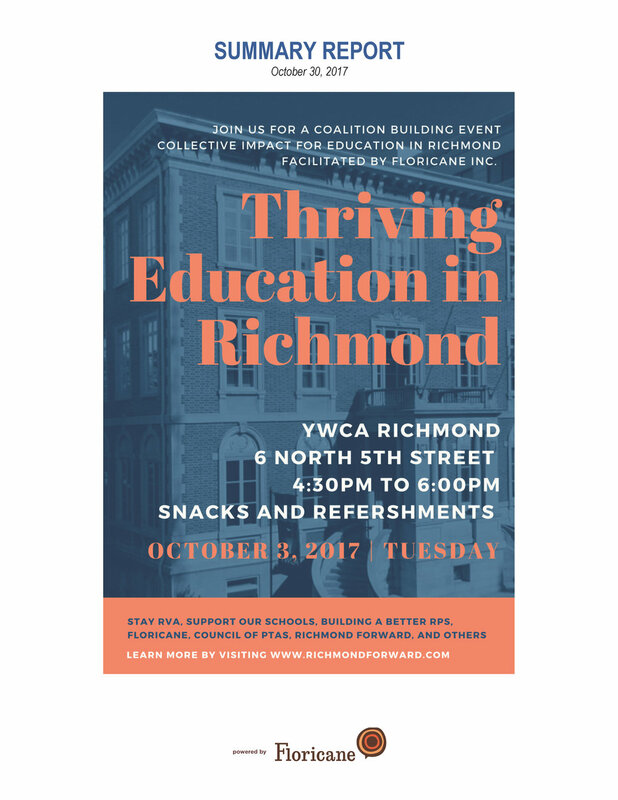 In early September 2017, Building a Better RPS, Council of PTA's, StayRVA, Support Our Schools, and Richmond Forward met to discuss a collective impact event to identify common priorities as we pursue a thriving education system in Richmond. John Sarvay and Floricane Inc. will facilitate the conversation and prepare a report with results. Read about the intention behind this collaboration here. On October 3rd, 2017, more than 60 community leaders and volunteers from dozens of advocacy groups, service providers, and philanthropic foundations came together at the YWCA of Richmond. The meeting’s goal was to begin building a network of service provider and advocacy stakeholders around a collective impact model. Read the full recap here. On November 8, 2017, twelve participants of the Thriving Richmond network met to discuss next steps. It was decided that a survey was needed to inform next steps and to capture contact information for all the participants. Read the full recap here. During April 2018, Michael Digiacomo with the YMCA of Richmond put together this infographic to explain the results from the community survey and the contact map located above. Contact us at contact@RichmondForward.com if you want to join this effort!